The latest discovery in my hunt for polymer and texture techniques led me back to Celie Fago. She posted these carving and texture plate tips on her blog a while back and I happily stumbled upon them. When Celie first started in polymer, she spent many hours carving warm, baked polymer and she developed many tricks, including ways to keep tools sharp. 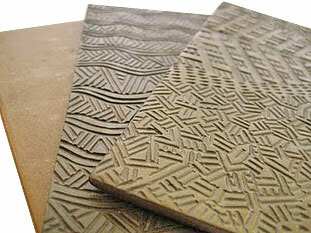 Time-intensive carving made her think about creating texture plates which she now uses for both metal clay and polymer. You’ll see evidence of both techniques in her Etsy shop. I hope your weekend is filled with texture. WOW! what talent and beautiful workmanship. Celie’s work inspires me greatly! Her blog has been a BIG help with tips on carving and general in formation on tools and process. Celie has it all…the imagination, creativity, confidence and skill to bring her visions to life. Even better, she couples her stunning work with the open graciousness of a true artist. Inspiring indeed! what a nice set of post about handmade textures!!! I engrave since school in some wax (I am going to hurry to test the warm baked clay!!! ), but my gouges are definitively too big for the greater part!!! What a good idea that Celie shows us her! After those of Gennine! What a parade of gouges! What about Tamara, Blockpartypress? What textures that side also! Wooah, that’s amazing what one can do with polymer clay. Thanks to bring us the proof that it’s just limited to imagination. What a great work !